If you place your fingertips just under your ears on either side of the face, you can feel something moving beneath the skin as you open and close your mouth. These are your temporomandibular joints, and they do the important work of connecting your mandible to your skull, facilitating essential actions like chewing and speaking. Unfortunately, even the slightest dysfunction in this area can lead to a variety of severe symptoms. At Collins & Montz Dentistry, we regularly evaluate patients for TMJ disorder, and several therapy options are available if needed to help you regain the quality of life you deserve. Contact our Melbourne, FL office today to schedule your first consultation with our doctors, or if you have any questions for our dedicated staff. 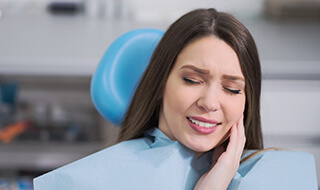 Occlusal Adjustment – If your resting bite is causing the aggravation, our doctors can provide any number of restorative services or alterations in order to reintroduce harmony and alleviate discomfort. Occlusal Splint – These customized appliances are designed to cushion the mouth from the negative effects of teeth grinding/bruxism (a common source of TMJ disorder) and provide a more proper positioning for your jaw. Over time, the continued use of a splint may even be able to create long-term improvements for many patients. TENS Machine Treatment – Our TENS unit works by using electrical pulses to stimulate the muscles, essentially massaging them so that they fully relax. By eliminating strain and nerve pressure, patients are able to experience immediate relief, and our team can better determine the best method for long-term treatment.